It's all about listening. If you look at this process as a "listening exercise" rather than a "report card," you'll be in a better posture to receive objective feedback. Don't think in terms of "score" but rather in terms of "awareness." Every church will have things they are doing well and things that could use some attention - awareness of the issues is half the battle and you only gain awareness via listening to everybody (as opposed to limited feedback from friends, committees, other leaders, etc.). Swing the doors wide. Invite as many people as possible to participate - the more feedback the better. There's no point in going to the effort of collecting data if there's not enough of it to have confidence in the findings. You want to know that you've collected a solid percentage of the church population and that the data represents well the views of the church as a whole. Have a thick skin. Be prepared for the fact that some people will be overly critical and in some cases communicate their opinions with little or no tact. Consider it a leadership badge of honor to have a house stable enough not to be blown over by the occasional outspoken critic. Do your best to stay objective and not get defensive. Take it with a grain of salt and remember that the most important thing is that you remain open to receiving objective feedback for the purpose of arriving at a clear view of reality. Even if you disagree with the feedback, dig for the diamond rather than discarding it by using a question such as, "Assuming we're dealing with a rational person who doesn't critique without cause (albeit emotionally charged), is there a truth at the root of this critical remark that we should be aware of?" Use the data. This may seem obvious but the last thing we want is to have you go through this process to receive a report that you glance through and then stick on a shelf somewhere. Discuss the data together and set reasonable goals (think simple) about how you intend to act on the findings to improve your ministry. Some goals may be huge, others may be quite minor--the important thing is to have well defined target goals (ideally with a date attached) that give your whole team a sense of direction and accountability. It doesn't need to get overly complicated and the fewer goals you have the more focused you'll be. Keep it simple and well defined. A Church Health Coach could be an enormous help to you in this "now what" phase after you've completed the survey and received the report. These coaches come along side you on an hourly basis by phone to provide expertise, outside perspective, and accountability. 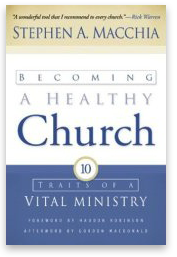 Check out http://www.healthychurch.net/telecom_pkgs.htm for more info on coaching packages. Make a survey part of your routine. Do this every 12-24 months to make sure you've got your finger on the pulse. So much can change in a year or two and awareness of the issues is critical to healthy leadership.